No Chimney Cap – an uncapped chimney is basically the simplest cause and most obvious, an open top to a chimney is an open invitation for rain and snow to enter your chimney and to all local birds, insects and animals. Keeping out birds, rodents and other animals as well as debris from trees, and Mother Nature’s elements is a good enough reason to cap your chimney. Build up of debris can cause blockages and limit the efficiency and safety of your chimney, a blocked chimney can lead to CO (Carbon Monoxide) Poisoning. If your chimney is for a wood burning fireplace or stove then, add to that the dual use as a spark arrestor, preventing sparks or embers from leaving your chimney and igniting nearby flammable objects or the roof itself. Makes installing a chimney cap a useful, logical and necessary investment. It is also not very expensive to purchase or install. An additional measure of security and protection is installing a lock-top/roof-top damper, which also prevents weather, animals and in addition prevents cold air from entering the chimney and flue. 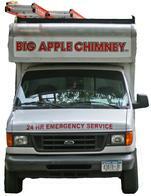 Big Apple Chimney can come and assess what your best options are. Chimney Crown Cracked/Damaged– A Chimney Crown is designed to prevent moisture from entering the chimney around the clay or steel liner protruding from the chimney. The crown can be made of stone, concrete or mortar and is usually sealed with a flexible, waterproof sealant. If the chimney crown is cracked or the sealant/waterproofing has worn-out, water from rain or snow can easily leak thru those cracks and down the chimney, causing leaks, deterioration and other damage to your chimney and flue. Chimney Flashing Damaged/Bent or Worn-out – Chimney flashing closes the gap between the bricks and the roof shingles and is usually made of aluminum or copper. It is designed to prevent water from entering between where the bricks and mortar of your chimney come through the roof, there is sometimes a large gap that needs to be closed or water can easily pour through if not sealed properly. Roof tar is not an effective sealant; a flash sealer is a more appropriate application. If you have no flashing or a tar covered flashing this may be the source of your leak. Interior Condensation (lack of a liner) - Gas boilers and heaters produce a temperature exhaust and has a high moisture content, if your chimney is too large or not insulated properly then condensation can be a problem, the installation of a properly sized and insulated chimney liner can instantly fix this problem of condensation and prevent leaks that occur due to this cause. Deteriorating Bricks or Cracks in Mortar – damaged, weather beaten or deteriorating bricks or mortar are absorbing or passing water into the chimney and leaking into your home. A fix for this maybe re-pointing, rebuilding or resealing/waterproofing your chimney bricks and mortar. A Leak in your Chimney can be hard to detect as water travels and can be hard to trace by eye, we can see obstructions and water trails with powerful flashlights and mirrors. We also provide inspection services in which we use an infra-red camera that can scan your flue from top to bottom. Detecting loose mortar joints and water leaks. Water leaks are common in old and deteriorating mortar and are a cause of other hazardous leaks (CO , Smoke & Soot). When water gets down into the mortar joints and brickwork it can become trapped and then freeze, causing the mortar and brickwork to expand, creating gaps, holes and cracks. Big Apple Chimney has the experience and technical expertise to handle any repairs regarding a leak in your chimney or roofing. We offer Complete Waterproofing Services, for all types of Roofing, Chimneys and Metal Stacks. Leaks can originate in your Chimney Crown, Chimney Flashing, Chimney Masonry, Flue Pipe Insulation, Lack of a Chimney Cap, Under or Oversized Flue Liner, Loose Brick, Loose Clay and Mortar Joints. 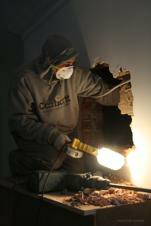 For a Free Estimate or For Immediate Service you can call us 24 hours a day at Big Apple Chimney 212-785-9788. Big Apple Chimney’s Mechanics and Technicians have been in the Chimney & Fireplace business over 20 years. We are a Better Business Bureau (BBB) accredited business with an A rating since 2006. Big Apple Chimney offers Complete Chimney and Fireplace Services, H.V.A.C, Masonry, Roofing and Complete Historical Restoration Services.